A good theater critic acknowledges his or her prejudices. A good theater critic is more concerned with stimulating the discussion and provoking interest than in making judgments. A good theater critic is smart enough to know that each production experienced must be evaluated on the basis of what it is trying to achieve, not on the basis of what the critic thinks that achievement should be. Why all the prescriptions? Well, I’m not in love with the material and some aspects of the production. 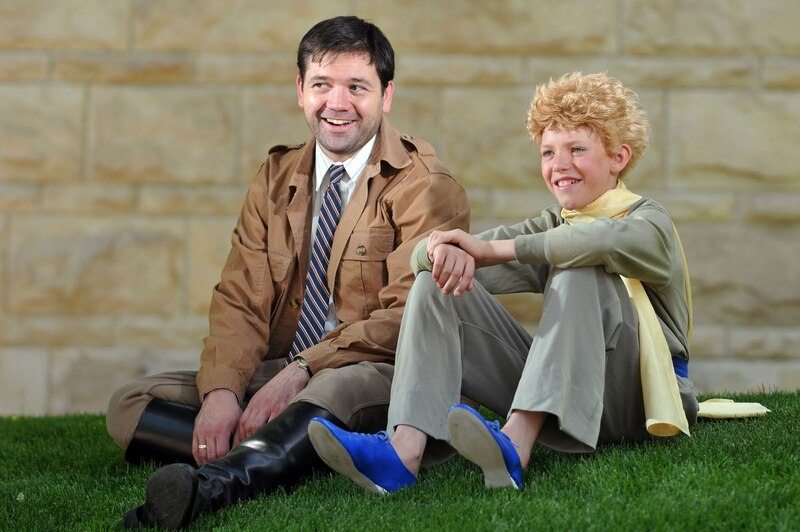 However, the Colorado Shakespeare Festival adaptation of Antoine de Saint Exupery’s “The Little Prince” does what it sets out to do – it presents a modern fable in pleasing visual terms. In my opinion, if you love the book you will love the show. It succeeds in sharing a message about seeing with your heart, a valuable lesson for anyone. It’s great for families and younger kids. The original author’s writing is, for me, gratingly saccharine – faux-naif, flatly philosophical, sappy and sentimental in the tradition of others such as Richard Bach and Kahlil Gibran. Then again, I used to love Cat Stevens and still can’t tear myself away from a screening of “Harold and Maude” or “It’s a Wonderful Life.” My bad. Same feeling, different flavors. So, if you are of a cynical bent, this show is not for you. Philip Sneed’s direction is intensely visual and succeeds completely on that level. He incorporates the Aviator’s drawings in process by throwing the drawing process up onto a screen behind the players, even as the lost and life-threatened Aviator scribbles away on his notepad. This neat technique gives life to Saint Exupery’s exuberant sketches and pushes the action of the play along very agreeably. Clare Henkel’s costumes are spot-on in terms of illustrating archetypes. The flat cutouts of Trefoni Rizzi’s set accentuate the childlike perspective expressed in the play, and much work is done by Rizzi’s lighting plot – it moves the characters around and across the stage, and sets mood instantly. Timothy Orr and Rudy Garcia’s sound design is apt as well – twining African and French melodies together in a shifting plot of contrasting sensibilities. The ensemble, playing fairy-tale characters, doesn’t have much with which to work. Jake Walker gets to provide a string of funny snapshot roles as the wrong-headed inhabitants of various planets the Little Prince visits on his curious journey. The Little Prince is played in turn by child actors Orion Pilger and Alastair Hennessy (I saw Hennessy at the opening). The Aviator is played by Tom Coiner, who does his best to overcome a French accent throughout the play. Why Coiner, and Emme Watkins as the Rose, are saddled with this choice is pretty much beyond me. It’s difficult enough to take this material seriously without the Pepe Le Pew/Inspector Clouseau verbal garnish. It pushes the show over the edge into a cartoonish feeling. I know there are serious and profound undertones in this tale, but I missed them. Maybe I should read “Chicken Soup for the Soul-less.” In the meanwhile, those who have the gift of seeing with their hearts, or know someone who needs to learn that lesson, should go and judge for themselves. 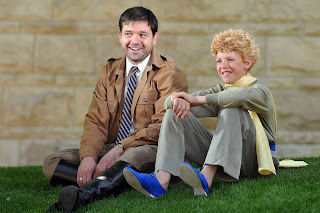 “The Little Prince” is presented by the Colorado Shakespeare Festival through Aug. 14 in the University Theatre on the campus of the University of Colorado. For tickets and information, please visit coloradoshakes.org or call 303-492-0554.